As the Governor Ben Ayade's led administration rolled out the drum to mark its first year anniversary on May 29, 2016, LANRE AROTIMI reports that Cross Riverians, cutting across various human endeavors, are still recounting amidst the high score the government accorded itself on tangible achievements it has recorded so far. At the inception of his administration on May 29, 2015, the governor, Ben Ayade, a businessman, an academic and former Senator representing Cross River northern senatorial district in the senate, did promise to take the state to greater heights, its dwindling monthly allocation from the federation account notwithstanding. While taking over the mantle of leadership from his predecessor, Senator Liyel Imoke, at the International Convention Centre (ICC) in Calabar, the governor said his administration will not only ensure that no child in the state goes to bed hungry in the course of his stewardship, but will as well embark on some signature projects, including the construction of a deep sea port, 260 kilometer super highway and a garment factory, all geared towards boosting the state's economy and job creation for the teeming unemployed youths in Cross River. However, one year after the governor's historic speech, some Cross Riverians bared their minds on whether he has been able to kick start or actualize his outline projects, notwithstanding his promises in other sectors of the state's economy. 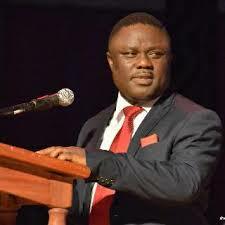 While assessing governor Ayade's one year stint in office, some political pundits, economic analysts among others, expressed wonder over his vision for the state, vis-a-vis his leadership style; while others gave his administration kudos for setting a developmental template for Cross River State, once considered to be a civil service enclave. In his assessment of the administration, an economist, Dr. Peter Mba, said the impact of some of the government's ventures might not be felt immediately. He urged Cross Riverians to give the governor some time to actualize his goals. Mba, who applauded the state government for the prompt payment of workers' salaries, described the administration's outlined projects, including the construction of a 260 KM super highway and a deep seaport as a long term projects with the potential to stimulate the state's economy upon completion. The Cross River State Commissioner of Finance, Mr. Asuquo Ekpenyong (Jnr.) gave credence to Mba's position on the issue of prompt payment of workers' salaries, attributing the feat to excellent financial management and strict fiscal discipline by the governor Ben Ayade's led administration. Responding to our Correspondent's enquiry via a text message, Asuquo said “Excellent financial management and strict fiscal discipline by his excellency, Prof. Ben Ayade, has been the secret behind the administration's achievement in this regard. Dr. Mba, however, faulted the government in the area of bloated political appointees, saying no government can afford such galore of appointments in the face of national economic recession. According to Mba, who is also a lecturer in the University of Calabar, “With the work at the garment factory, the ground breaking ceremony of the 260 kilometer superhighway and the deep sea port projects, we can safely say that something is about to happen and it's not a short term job. “The idea of bringing some interested parties (private sector) to come and assist in the road project is very good. It's a very good idea if it works. “In assessing his one year in office, I commend governor Ayade, because he is one of the few governors that pay salaries, even before the month ends. It's a welcome development because when salaries are being paid on time it stimulates consumption and when people consume, people that produce would have the course to produce and if they produce, they generate employment. This is something that most states governments find very difficult to do. “Whether he borrows it or not, nobody is interested wherever the money comes from. What we are interested in is the consistency in the payment of salaries, considering the little he gets from the federation account on a monthly basis. “Lets' look at some of the projects he is talking about from the long run, not from the short run. These are not something that can be done within one, two or 3 years. While expressing support for the federal government's deregulation policy in the petroleum sector, Mba said political appointments can never be a sustainable way of creating employment. He argued that some of the governor's appointees; majority of whom are currently redundant, would have been more productive back in their respective communities. “The government erred in the area of bloated political appointees. Even the FG cannot engage such number of appointees within a short time. “It's a wrong one. The state is not an employment galore. The state should be talking about productivity. How many of them are productive. I heard the name of some of the political appointees; some of them would have been productive in the villages. They have lots to do in their communities, rather than come to the city and seat idle. Will the state be able to pay, how much is subvention from FAAC? “I know some of these people who were doing very well in their communities, but they are now in the city managing one room apartment, does it make any economic sense at all? All these monies would have been injected into all those projects the governor has been talking about”, he said. Also speaking, a senior member of the Calabar Chamber of Commerce, Industry Mines and Agriculture (CALCCIMA), who preferred anonymity, applauded the administration's strides within one year in office. She, however, said the chamber was still trying to under study the administration's policy thrust in the area of industrialization and had decided to keep mum; while urging the government to reflect on all its ventures in the past one year with a view to make amends, where necessary. According to the CALCCIMA official, who also faulted the administration's bloated political appointees vis-a-vis the creation of ministries and portfolios with over lapping functions; the government, no doubt, means well for the citizenry. She said: “I congratulate the administration on its one year strides, but encourage her to look back in one year and learn from it. “We give them kudos for the initiatives, but we urge the government to ensure its sustainability. Even with the crisscrossing of ministries, we thank God for one year. “Rotimi, sincerely, I think we are still trying to understand what we are doing in the state, so, I will rather not make a comment because everybody is agitating as to what is right and what is wrong, what impression they can make and what is sustainable. “What is happening is brand new thing, so we really need to understand what they are doing first. According to the state's commissioner for agriculture, Prof. Egrinya Eneji, the government had over the last one year made concerted efforts to ensure that the agricultural sector do not only serve as an avenue for job creation, but also contribute significantly towards the growth of its economy. To this end, he disclosed that the government recently reached a partnership agreement for the establishment of a 400,000 hectares sugarcane production and processing industry. He said the MOU was signed with TRANSHAHARAN Group in December 2015, adding that initial site preparation is on-going and a biotech facility supporting this enterprise is being built in Calabar (opposite the garment factory). Also, the commissioner, via an email to our correspondent, said five billion naira ultra-modern rice development project in collaboration with Thai-Africa group, involving commercial seedling production (in Calabar) and field production/processing at Bansara MOU had been signed and land allocated. He noted that the initial soil sampling and site characterization had been completed and production on a 2,000 ha space will commence in August, 2016. Geared towards motivating farmers in the state, he said full documentation and approval of loan facility in the tune of N150 million to be given to small scale farmers in the state had been completed since January, 2016, stating that the disbursement will commence as the farming season is flagged off. While in the health sector, it was gathered from the office of the Director General of the State's Primary Health Care Development Agency, Mrs. Betta Edu, that so far, four primary health care centres including the new one that was recently commissioned in Ikom by Mrs. Aisha Buhari, wife of the President, had been renovated and currently in use by Cross Riverians, especially the women folk. According to a press statement from the DG's media aide, Mr. Charles, the renovated Primary Health Centres (PHC's) include; Bedia PHC in Obudu local government area, Adijinkpor in Ikom, as well Aningeje PHC in Akamkpa local government area in the state. The statement added that there are other ongoing intervention programmes in the health sector across the three senatorial districts in the state. Reflecting on the governor's one year in office, a legal practitioner and public commentator, Barr. Utum Eteng, expressed worry over the deteriorating sanitation condition in the Calabar metropolis, recently, urging the government to do the needful. “I would rather ask you as a press man, is the Calabar you use to know the same with what you see now? The difference is clear. “Look at CUDA building, an organization that is to keep the city clean, look at how unkempt and dilapidated the place is. And that is the gateway to the airport. “There is the need for the government to adequately fund the sanitation agency so that it can perform its duties effectively”, he said. Though, it was reliably gathered from the governor's aide that concerted efforts had been made to address the sanitation situation in the metropolis. According to the governor's Chief Press Secretary, Mr. Christian Ita, via an email “ In order to protect and sustain the environment, as well as retaining the status of Calabar as the cleanest city in Nigeria, the administration, on assumption of office, embarked on the following policies and programmes; recovery and protection of the green areas, desilting of areas prone to flooding, re-grassing of degraded areas within the state city centre, clearing of wages of all other urban centres, procurement of waste trucks and compactors as well as audit of all erosion sites in the state. In the area of security, he said the Ayade's led administration remains committed towards ensuring that Cross River maintains her lead position as the most peaceful state in Nigeria, despite pockets of one petty crime or the other around. This, he explained was achieved through a strategic partnership with all security agencies in the state over the last one year. Meanwhile, the governor's Special Adviser on administration, Hon. Mark Obi, has attributed the recent influx of investors into Cross River State to his principal's ingenuity. Obi, who stated this in an exclusive interview yesterday in Calabar, described Cross River State as Nigeria's most preferred destination for investors. According to the former lawmaker, due to the friendly industrialization policies of the government, investors, globally, are now attracted to Cross River, once considered to be a civil service state. He said in the last one year, quite a number of visible companies, including the garment factory; with the prospect of massive job creation have berthed in the state. The Special Adviser disclosed that as part of activities lined up to mark the 2016 democracy day, some projects including a massive water project in Ikom, an electrification project in Obudu, as well as a road project in Bakassi local government area, among others, were commissioned. Source: Nigerian News from Leadership News.